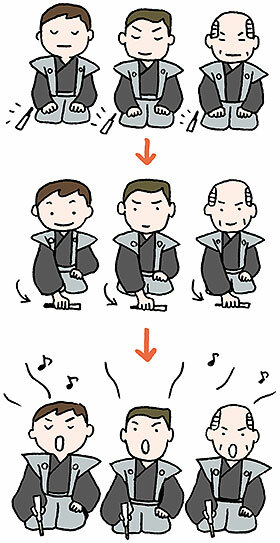 TRIVIA of Noh : Q144 : Why do singers put their fans in front of their knees? | Home | Trivia | Q144 : Why do singers put their fans in front of their knees? Why do singers put their fans in front of their knees? A fan is one of the properties that Noh performers consider the most important. Not only shite and tsure actors, but also all other performers, including the three main parts: waki and kyōgen actors and musicians, singers, and assistants bring their fans with them when entering the stage. Let's pay attention to the movement of the singers. After the singers enter the stage from the side entrance, they sit in the designated place (jiutai-za) in order and put their fans on the floor on their right. Then they slide the fans to their front and stand by. When the chanting part comes, they pick up their fans and begin to chant. Why do they put their fans in front of them and stand by? It is believed that they do so because they draw a line of demarcation between the actors' and singers' areas and fix the bounds of a sacred place. If we divide the stage into two spaces (See Trivia141), the fans work as the separators for them. It is not Noh alone in which fans act special roles. in practising for classical Japanese dance or tea ceremony, people often sit on their heels, put their fans in front of them, and make a bow. It is also believed that they make such a movement because they express their humility by drawing a line between instructors and pupils with fans to describe they are at a lower place.